I found these laser scissors over at Grande Portal for $12. The blades are 8″ long and stainless steel, and the laser is FDA approved. And hey — lasers make any tool better, right? Even if you don’t need laser-guided scissors, you’ll probably be the only guy on the block with a pair. Update: Yes, we think this is a bit silly, too. It’s all in good fun. In case you miseed it: The LaserMax 9000. Wow. That is extremely cool and incredibly cheesy all at the same time. Somebody probably made a bunch of money patenting it, but I’m having a hard time thinking of a legitimate use other that pure novelty. Let me know if you can think of one but I’m stuck on this one for now. These would be handy for cutting cloth for sewing. Much like a circular saw with a laser, the father ahead of the line you can keep the laser straight, the more accurate you would be where the cutting is happening. Now I’ve seen everything. I thought the recent glut of laser-everything powertools was marginally interesting. Chop saws and drill presses – maybe (although I have to say – more useful in theory than practice (IMHO)). This is ridiculous. Wait, the laser is FDA approved? I think the FDA only approves lasers that are used for medial treatments (Lasik, hair removal, etc). Am I missing something? @Roscoe: Point well taken. It still just makes me smile. The next tool in this line is the laser guided pencil so you never miss the mark when making a mark. The only hold up to production is getting the laser to auto calibrate as the pencil gets shorter after repeated sharpening. The only good deal on laser guided scissors is you pay me to take them. Honestly. Maybe if you needed scissors that doubled as a laser pointer–like if you were presenting an arts and crafts how-to on powerpoint while making demonstration pieces as you go. Otherwise save your money! Goofiest idea ever? Almost! Which is precisely why I should pick up a few sets, and keep them in the original packaging. Perhaps remove the batteries, which will leak in the thirty or forty years it’ll take for them to accrue some real value. Think about it: Cocaine toothache drops. Uranium-lined water jugs. High-voltage muscle relaxers. 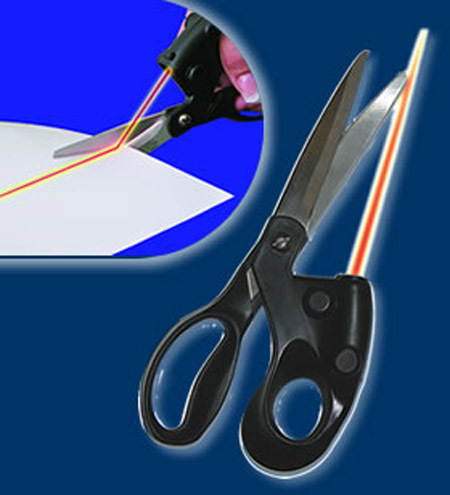 Laser-guided scissors. See the connection? Gimmicky stuff gets valuable after a few decades. This is the dumbest thing I’ve ever seen … which means I’ll buy maybe two of them as presents for my buddies as a joke. It seems to me that if you can’t cut a straight line with normal scissors, then attaching a laser to them won’t help much. If the laser is attached to the the piece that is following the laser line, it is much the same as a dog chasing its own tail. Around and Around we go…..
Um, the laser isn’t going to make a line across the paper like that. It will make a dot where it first hits the paper. Not terribly useful. Thanks for surfing here from Dan’s blog Nathaniel, but whether it makes a dot or a line is dependant on the optics of the laser (the line obviously significantly reduces the output power at any particular point by spreading the beam). Or it could have a mirror to oscillate the beam into a line to avoid the power loss, but I’d be amazed if they did that given how cheap (and cheesy) these things are.